When teaching skipper’s ticket courses I am often asked by clients if the regulations regarding skippering vessels under the influence of alcohol and drugs are the same as for driving vehicles and the simple answer is, no they are not. 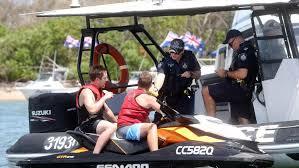 Police currently have no powers to random breath test skippers of recreational vessels. Many people are baffled as to why this is the case and so it is worth explaining the situation as it currently stands, before debating the pros and cons of proposed random breathing testing for skippers of recreational vessels. The regulation, quoted directly from the WA Marine Act 1982, states that: “Part III — Miscellaneous marine powers and duties. 59. Safe navigation (2) No person shall navigate or attempt to navigate a vessel while under the influence of alcohol or drugs to such an extent as to be incapable of having proper control of the vessel. Penalty: $1000.” So it is actually illegal, which is great, but the sixty four dollar question is, what is ‘to such an extent to be incapable of having proper control of the vessel’. Because there is no actual legal limit, this regulation is open to interpretation and does not provide marine safety authorities, police, or skippers with a clear standard to work from. Police must rely on visual impairment sobriety tests such as seeing a vessel driving erratically or a skipper unable to walk a straight line, all of which are difficult to prove in court. So it begs the question, of a $1000 penalty, after the horse has bolted, really being a preventative strategy. If everyone knew there was a legal limit and that could mean anytime you are skippering a vessel you may be random breath tested, then it would bring us into line with most other states and send a clear message that alcohol/drugs while skippering do not mix. There is actually some strong opposition to this possible legislation and I am happy to air these views, although I do not agree with them. The first argument is that the link between alcohol/drug use and boating incidents in WA has not been clearly established, therefore, if it is not broken, don’t try to fix it. While it is true that there has not been a WA, or indeed national in depth study on this problem, back in 2000 a study was conducted by P J O’Connor on ‘Assessment of fatal and non-fatal injury in boating’ in South Australia, where is was found that 39% of fatalities and 38% of fatal incidents in South Australia involved alcohol. Also, I do not require statistics to remind me of the clear link between alcohol/drug use and general impairment of motor skills. Remember, this proposed legislation will only relate to the skipper of the vessel and .05 equates approximately to having two standard drinks in the first hour and one every hour after. If I am on a vessel on an overnight mooring, secured to a pen or even at anchor, then obviously this will not affect me as long as I do not have a bender and then blow over the limit the next time I skipper again. This legislation was proposed back in 2015, following the high profile boating accident where Kate Campbell was almost killed when a drunken friend crashed a vessel on the Canning River. The Police Minister at the time, Liz Harvey, and Premier, Colin Barnett, did not pursue it at the time, but I for one hope it is passed this time.